Burger King has credited the return of its "chicken fries" for helping to drive a better-than-expected rise in second quarter sales. The deep fried chicken strips, first launched in 2005, were taken off the menu in 2012, but were reintroduced after customers demanded their return. "The ongoing guest outcries reached a point where they could no longer be ignored," it said at the time. Global sales in restaurants open at least a year rose 6.7%, it said. Parent firm Restaurant Brands said new burgers, store improvements and special offers also helped to drive the sales increase. Restaurant Brands was created last year, when Burger King's majority shareholder, 3G Capital bought Canadian coffee and doughnut chain Tim Hortons for $11bn. 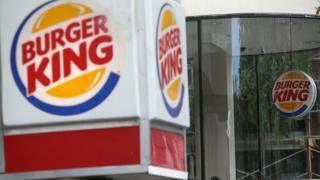 Burger King's performance helped profit at parent firm Restaurant Brands hit $9.6m (£6.2m) for the three months to the end of June. Sales from both groups totalled $1.04bn - again slightly higher than analysts had expected. Its results come just a few days after fast food rival McDonald's said sales had fallen in the second quarter. The firm said it had opened 141 new Burger King restaurants in the period, and 52 new Tim Horton ones.